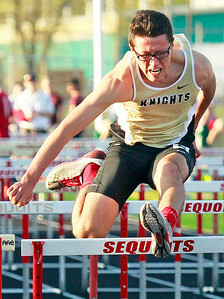 Candace H. Johnson Lakes Michael Zalapukis, Grayslake North's Griffin Gawena, Antioch's Landon Keefover and Lake Forest's Gavin Hoch compete in the high hurdles at the Lake County boys track meet at Antioch Community High School. 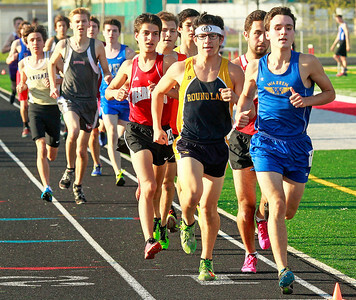 Candace H. Johnson Round Lake's Carlos Rosas and Warren's Andrew Miller, both 17, stay ahead of the pack during the boys 3200 meter run at the Lake County boys track meet at Antioch Community High School. 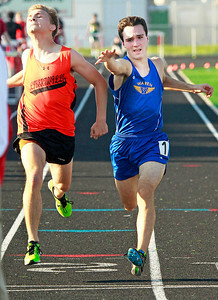 Candace H. Johnson Libertyville's William Johnson, 18, and Warren's Andrew Miller, 17, race to the finish line as they compete in the boys 3200 meter run at the Lake County boys track meet at Antioch Community High School. Candace H. Johnson Grant's Dylan Maranto, 18, competes in the discus at the Lake County boys track meet to come in second place at Antioch Community High School. 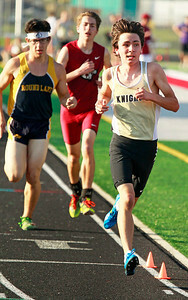 Candace H. Johnson Grayslake North's Cameron Detweiler (on right) competes in the boys 3200 meter run at the Lake County boys track meet at Antioch Community High School. Candace H. Johnson Grayslake North's Francisco Carrera, 18, competes in the 110m high hurdles during the Lake County boys track meet at Antioch Community High School. 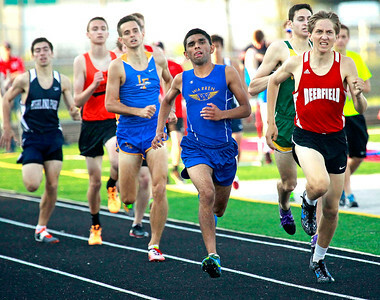 Candace H. Johnson Warren's Nathaniel Oommen (center) runs next to Deerfield's Henry Shore as they compete in the 800 meters at the Lake County boys track meet at Antioch Community High School. 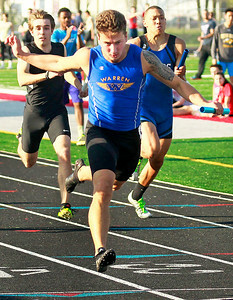 Candace H. Johnson Warren's Nick Marcinkus comes in second to the finish line as he competes with his relay team in the 4X100 race at the Lake County boys track meet at Antioch Community High School. Warren's Nick Marcinkus comes in second to the finish line as he competes with his relay team in the 4X100 race at the Lake County boys track meet at Antioch Community High School.